Eventually Isabel got a computer! This story changes slightly every time I hear it—often at one of her readings or just when I ask about it—but I love it because, in the end, perhaps it is me remembering it differently every time. Either way, it’s a charming story and I am glad to have this version first-hand for the blog. What if I started writing on another date and the book was a flop?? After a few years and a few books, January 8th became a good habit; it gave me discipline. By then my life was complicated—I had to travel, lecture, do innumerable interviews, I was getting tons of mail—so if I didn’t organize my calendar I would never have the time, solitude, and silence I needed for each book. That’s why I have kept January 8th as my sacred day in the year, the day I lock myself away and start a new book. I have not started something new every year, because sometimes it takes me more than a year to write a book, but I have started every book on the same day. In 2002 I decided it was time for me to take a sabbatical and fill up my reservoir; I had been working too hard for too long. I wrote down my sabbatical resolution, put it in a sealed envelope, and placed it on my altar. Then I forgot about it. Eight years later I found the envelope and decided that I really, really needed that sabbatical. I cleared my calendar for 2011. This is my year of resting, reading novels, playing with Olivia (my dog), learning crafts, dancing, walking in the woods, and charging my batteries. So what was Isabel doing if she wasn’t locked away on January 8th beginning her next novel? Looking for something to read or watch? Several years ago, after a trip to Chile, I read and enjoyed “my invented Country.” I always meant to read “House of the Spirits,” but never got around to it until now – with the publication of “Japanese Lover,” I decided it was time and what a wonderful book it is! Having almost reached the end, I wanted to confirm that it is really about Chile or, if not, a composite of Latin American countries. Having discovered this blog, I think that, not only is the novel about Chile, but I also think that the character Alba is based on Isabel herself and Trueba, on her own grandfather. Am I correct? >Good for you Isabel! It is good to take some time for ones self. Enjoy your time off. I will look forward to your next book. >en los últimos tres meses no he hecho mas que leer los libros de Isabel, me tope por casualidad con Paula, y desde ese preciso momento leí uno tras otro 6 de sus libros. tengo mucho por hacer todavía, por lo que espero que Isabel descanse tranquilamente y el 2012 este en la puerta de su imaginación una nueva travesía por su magia constante, excitante y única que nos invita a recorrer los confines del mundo…. >QUERIDA SARAH!! NO TE IMAGINAS LO FELIZ Y CONTENTA QUE ESTOY CON ESTA PAGINA, YA ANTES TE ESCRIBI..SI NUESTRA QUERIDA ISABEL YA SE MERECIA UN DESCANSO DONDE HAGA QUIZAS MUCHAS COSAS QUE HA DESEADO HACER Y NO HA PODIDO. NADA MAS RICO QUE HACER MANUALIDADES,CAMINAR O SIMPLEMENTE SENTARTE Y MIRAR SIN VER..QUIZAS DESCUBRA SONIDOS QUE JAMAS ANTES ESCUCHO… JUGAR CON OLIVAI LA ENTIENDO TAN BIEN YO ADORO JUGAR CON MI VINKYTO UN COOKER INGLES QUE ME HA ROBADO EL ALMA Y LAS PLANTAS TAMBIEN POR QUE ME LAS HACE PEDAZO JJAJA!!! !SI ESTUVIERA ACA EN CHILE LE PASARIA LOS CONDORITOS PARA QUE SE RIERA HARTO….,ME ENCANTA LA FOTO,LINDO CONOCER EN PARTE EL LUGAR , MUDO TESTIGO DE TANTA INSPIRACION Y SUEÑOS..(LA PUSE.. LA FOTO.. JUNTO A LAS DE MI FAMILA )BUENO MI QUERIDA SARAH TE MANDO UN GRAN ABRAZO Y A TRAVEZ TUYO OTRO PARA ISABEL MI AMIGA QUERIDA, MUCHISIMAS BENDICIONES.. DESDE CHILE!!! >This was so interesting to read – what a labor of love writing The House of Spirits on a little typewriter and then taping in extra pages. So glad you did as it is one of my favorite books. Also glad to hear that you are taking a sabbatical – everyone needs one of those now and again. >Lol!! I loved this post and it's good for Allende!! She needs some rest! While reading, it reminded me a lot of her book Paula, since she explains this disciple of hers (starting books at Jan 8) I hope she enjoys her sabbatical year!! God bless! >i have one of these computers on the photo. 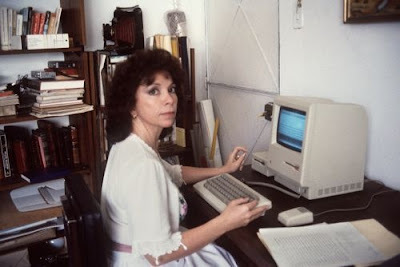 is there an isabel allende museum project i could donate it to? it is a collectors computer.